Imagine that you had a movie that shows the history of Earth from its beginning to the present day—as if a giant camera in space had recorded pictures of Earth over the last 4 1⁄2 billion years. How do you think the Earth would look in that movie at different times in history? How do you think it has changed? If you put the movie in fast-forward, you would see lots of action and lots of change! You would see that our planet has undergone remarkable changes over billions of years (Figure 12.3). Huge mountains have formed, been destroyed, and replaced with new mountains. The oceans have opened up and moved around the globe. The continents have moved around, split apart from each other, and collided with each other, until finally reaching their present locations. Life on Earth has also changed tremendously. At first, the Earth was not even able to support life. There was no oxygen in the atmosphere, and Earth's surface was extremely hot. Slowly, over millions of years, the Earth changed so that plants and animals could begin to grow. Living things then changed the Earth even more. Figure 12.3: The Earth from space. The Earth looks very different today than it did when it first formed over 4 billion years ago. We often enjoy using our imagination to think about what the Earth was like when dinosaurs roamed around (Figure 12.4). What images come to your mind when you think about the dinosaurs? Now imagine a time on Earth before even the dinosaurs. Imagine the time before any living thing was on Earth. What images come to mind now? How do you think the Earth looked when it was first formed? This lesson will help you understand how the Earth formed, what it looked like during its earliest years, and how life first developed on Earth. Figure 12.4: The Earth and its dominant life forms have changed throughout the Earth's long history. The following questions are addressed in other chapters and will help you work through this lesson. Research these before you move on. What conditions do plants and animals require to live? What is the atmosphere and what is it made of? How do weathering and erosion affect the Earth? We can construct the formation history of our solar system by looking at regions where other stars are forming now. Star formation begins when a giant cloud of gas and dust collapses under its own gravity. As the cloud contracts, it begins to spin faster and settles into a disk-shaped structure. We see these disc-shaped objects (called proplyds) in the Orion Nebula (Figure 12.13), where the new stars are forming today. Most of the dusty disk material drains toward the center where the density gradually increases until the enormous central pressure triggers nuclear fusion reactions and the star is born. However, a relatively small fraction of the disk material is left behind in the form of ice-coated dust grains. The icy mantles of the grains begin sticking together and eventually grow to meter-sized rocky boulders called planetesimals. The planetesimals collide and accrete into larger bodies that are tens of kilometers in diameter called protoplanets. Once the protoplanets clear a gap in the disk, they become bonafide planets and their orbits begin to stabilize (Figure 12.6). Figure 12.6: An artist's rendition of a baby star still surrounded by a protoplanetary disc in which planets are forming. The process of planet formation is messy. Not all of the planetesimals are accreted into planets. Millions of planetesimals remain as the leftover debris and are now the asteroids and ice-coated comets in our solar system. In the first hundred million years after the formation of the Sun, collisions between the leftover planetesimals and the planets were common. We see evidence for heavy bombardment by planetesimals on the surfaces of the moon and Mercury (Figure 12.7 and Figure 12.8). Figure 12.7: The surface of the moon is scarred by collisions with debris that was meters to kilometers in diameter. Most of the planetesimals were accreted into planets or moons, but some of these objects remain as meteors, asteroids, and comets in our solar system today. Figure 12.8: The surface of Mercury shows similar collisional cratering. Most of the planetesimals were accreted into planets or moons, but some of these objects remain as meteors, asteroids, and comets in our solar system today. The same types of collisions would have occurred on the surface of the Earth, however erosive processes have erased all except the most recent of these collisions. Pictured in Figure 12.9 is a Meteor Crater in Arizona. Figure 12.9: Meteor crater in Arizona was formed about 40,000 years ago by the impact of a meteorite that was about 50 meters in diameter. Such collisions are rare today. About 100 million years after the formation of the Sun, the gravity of the planets and moons in our solar system had swept up most of the planetesimals. However, millions of these objects still remain in gravitationally stable orbits in the main asteroid belt of the solar system, in the Trojan asteroid belt, or out beyond Neptune and Pluto in the Kuiper belt. Illustrated in the sketch below is the location of the largest reservoir of asteroids in our solar system today (Figure 12.10). Figure 12.10: This sketch shows the largest reservoir of asteroids in our solar system today. Earth is the only object in our solar system known to support life (Figure 12.11). Today there are over 1 million known species of plants and animals on Earth. 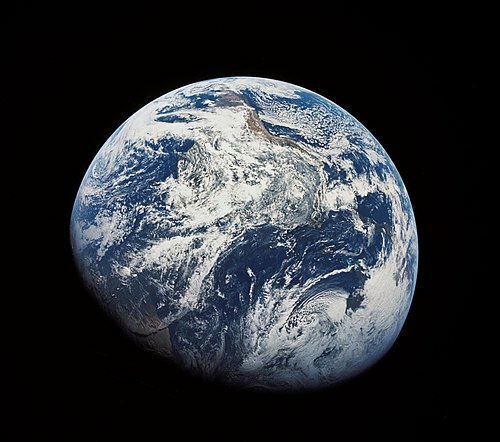 Figure 12.11: The Earth formed at the same time as the other planets in our solar system about 4 1⁄2 billion years ago. The materials that came together to form the Earth were made of several different chemical elements. Each element has a different density, defined as mass per volume. Density describes how heavy an object is compared to how much space the object takes up. After Earth's early formation, the denser elements sank to the center. The lighter elements rose to the surface. You have probably seen something like this happen if you have ever mixed oil and water in a bottle. The water is denser than oil. If you put both in a bottle, shake it up, and then let it sit for a while, the water settles to the bottom and the oil rises up over the top of the water. Today, the Earth consists of layers that represent different densities (Figure 12.12). Earth's center is called its core. The core is made of very dense metal elements called iron and nickel. The outermost layer of the Earth is its crust. The crust is made mostly of light elements such as silicon, oxygen, and aluminum. More information on the different layers of the Earth is presented in the lesson on plate tectonics. Figure 12.12: The Earth is made of several layers that vary in density. The center of the Earth is the core, which is the densest. The outermost layer is the crust, which is the least dense. The middle layers make up the mantle. The early Earth was very different from our Earth today. The early Earth experienced frequent impacts from asteroids and meteorites and had much more frequent volcanic eruptions. There was no life on Earth for the first billion years because the atmosphere was not suitable for life. Earth’s first atmosphere had lots of water vapor but had almost no oxygen. Later, frequent volcanic eruptions put several different gases into the air (Figure 12.13). These gases created a new type of atmosphere for Earth. The volcanic eruptions spewed gases such as nitrogen, carbon dioxide, hydrogen, and water vapor into the atmosphere—but no free oxygen. Without oxygen, there was still very little that could live on Earth. Figure 12.13: Volcanic eruptions occurred almost constantly on the early Earth. Eruptions put water vapor, carbon dioxide and other gases into the air that helped create Earth's early atmosphere. Slowly, two processes changed Earth's atmosphere to one that is more oxygen-rich—like the one we have today. First, radiation from the Sun caused water vapor molecules to split apart. Remember that a molecule of water is made of the elements hydrogen and oxygen, or H2O. Radiation from the Sun split some of the water molecules into hydrogen and oxygen. The hydrogen escaped back to outer space. The oxygen accumulated in the atmosphere. The second process that changed Earth's early atmosphere was photosynthesis (Figure 12.14). About 2.4 billion years ago, a type of organism called cyanobacteria evolved on the early Earth and began carrying out photosynthesis. Photosynthesis uses carbon dioxide and energy from the Sun to produce sugar and oxygen. The cyanobacteria were very simple organisms but performed an important role in changing Earth's early atmosphere. They carried out photosynthesis to produce the materials they needed to grow. They gave off oxygen to the atmosphere as they did this. Figure 12.14: Bacteria capable of photosynthesis first appeared on Earth about 2.4 billion years ago. Photosynthesis takes sunlight, carbon dioxide, and water and produces sugar and oxygen. Photosynthesis contributed oxygen to Earth’s early atmosphere and helped change it from one rich in carbon dioxide to one rich in oxygen. Oxygen in the atmosphere is important for life for two main reasons. First, oxygen makes up the ozone layer. The ozone layer is in the upper part of the atmosphere, and is made of O3 molecules—a particular type of oxygen molecule. It blocks harmful radiation from the sun and keeps it from reaching Earth's surface. Without an ozone layer, intense radiation from the sun reached the early Earth's surface, making life almost impossible. Secondly, oxygen in the atmosphere is necessary for animals, including humans, to breathe. No animals would have been able to breathe in Earth's early atmosphere. However, there were probably several types of bacteria that lived on Earth during this early time. They would have been anaerobic, meaning that they did not need oxygen to live. Very simple cells lived on Earth for the first few billion years of Earth's history. Some of the oldest fossils of more complex organisms are from about 2 billion years ago. They are found in Australia. Besides changes in life and the atmosphere, other changes have also happened since the Earth was first formed. Early volcanic eruptions on Earth released large amounts of water vapor into the atmosphere. The water vapor slowly condensed and returned to Earth's surface in rainfall. This formed the oceans. Water began to cycle on Earth, and events like rainfall and storms next began to change the Earth's surface through weathering and erosion. The Earth's Fresh Water chapter gives more detail on how water cycles on Earth. The continents were in very different locations than they are now. Scientists do not know how Earth's land looked exactly after the planet's first formation. They do know that North America and Greenland formed one giant landmass called Laurentia about 1.8 billion years ago. By about 1 billion years ago, Antarctica may have been close to the equator, even though it now sits at Earth's South Pole. Today, Earth's continents continue to slowly shift around the globe. The Earth formed more than 4 billion years ago along with the other planets in our solar system. The early Earth had no ozone layer and was probably very hot. The early Earth also had no free oxygen. Without an oxygen atmosphere very few things could live on the early Earth. Anaerobic bacteria were probably the first living things on Earth. The early Earth had no oceans and was frequently hit with meteorites and asteroids. There were also frequent volcanic eruptions. Volcanic eruptions released water vapor that eventually cooled to form the oceans. The atmosphere slowly became more oxygen-rich as solar radiation split water molecules and cyanobacteria began the process of photosynthesis. Eventually the atmosphere became like it is today and rich in oxygen. The first complex organisms on Earth first developed about 2 billion years ago. Describe how the different layers of the Earth vary by density. When did the materials that make the Earth separate out by density? Explain two reasons why having an oxygen-rich atmosphere is important for life on Earth. Scientists believe that Earth's ozone layer is shrinking because of human activities and air pollution. What affect might this have on Earth's life forms? Describe the role of cyanobacteria in changing Earth's early atmosphere. List three ways the Earth was different today from when it was first formed. Suppose that the Earth had been much cooler when it first formed. How would the Earth's interior be different than it is today? The mixture of gases that surrounds the Earth and contains the air we breathe. Cooled and changed from water vapor to liquid water. Density means mass per unit area. The smallest possible amounts of a chemical substance. Energy given off by the Sun. A group of living things that have similar characteristics. Vapor water in a gas form. How did life on Earth develop from simple bacteria to more complex organisms? When did complex organisms like fish, reptiles, and mammals appear on Earth? When did the major features of the Earth that we know today first form? Questions: How do you think the Earth formed? What other planets do you think are in the universe? what is your background knowledge on tis type of science? This page was last edited on 25 October 2016, at 16:40.